We interviewed an award travel connoisseur to find out how to make the most of your hard earned miles and travel points. Dominic Perilli is a forensic consultant who works for a global accounting and consulting firm. He spends 70-80% of his time on the road. After three years of living out of a suitcase (and accumulating travel points and miles), Dominic turned his passion for booking award travel into a company call AwardBandit.com to help others. What are your favorite travel reward programs & what programs do you have loyalty/status with? My favorite airline to fly with is American Airlines due to its familiarity. I’m somewhat of a creature of habit in that I’ve been with US Airways since the 90’s and being based in Philadelphia, a major AA hub, I don’t see any reason to fly another airline! Unless there is a great deal, of course. I am a total Starwood fanboy. I hold Platinum SPG status and think they are on the cutting edge in terms of hotel innovation and customer experience. It’s somewhat unfortunate to see larger brands like Hilton and Marriott remain stagnant when Starwood is constantly innovating and adding gorgeous, chic hotels to their portfolio. Kimpton is a close second! Do you know of other frequent travelers who waste their points and miles earned from travel? I make a conscious effort to save everyone from recklessly spending points on terrible value items like consumer products (headphones, luggage). Additionally, I religiously follow The Points Guy’s monthly valuations and help friends and family calculate the cost/benefit of using points vs. cash. Generally speaking, if you find a cash rate that is higher than the points value, go with the points (and vice versa). For example, this Labor Day I will be staying one night at the St. Regis Rome at a cost of 20,000 Starpoints. The cost in cash is roughly $550 and the Starpoint cost is 20,000. At TPG’s current Starpoint valuation of 2.5 cents per point, that works to $500 so I booked using the points! Additionally, I am SPG Platinum so I will (hopefully) receive a free suite upgrade upon arrival. Since my business travel requires I use a wide range of transportation options (car, train, airplane), it’s difficult for me to gain status on airlines. I instead easily get status with hotels. I currently hold top-tier status with Hilton, Starwood, and Hyatt. How do you use your points and miles? I use my points and miles mainly for hotels and flights. I think getting premium perks at hotels is just about the coolest thing ever. I’m still a kid in that regard! I value hotel points higher than airlines because if you’re taking a long trip, your hotel stay will more than likely be more expensive than the flight. How do you accumulate the most points and miles? I accumulate my points and miles through credit card sign-up offers, hotel stays, flights, and optimized e-shopping/dining. Many loyalty programs have e-shopping/dining portals where you can earn bonus points and miles just by shopping! One example is 1-800-Flowers. Each year around Valentine’s Day, 1-800-Flowers offers a generous 9-10 miles per dollar! This year I took advantage using the AA e-shopping portal. The flowers cost $80 and I earned 800 American miles which equates to about $15 in value. That may seem like a small drop in the bucket, but if you consistently use the portals for your spending, you can rack up some serious balances! What advice would you give other travelers for accumulating points and miles that can be easily redeemed? Pick a few programs and stick to it. The last thing you want is to take advantage of a ton of credit card bonuses and be left with a distribution of points that you can’t take advantage of. The key is to strategize. Pick a location! If you want to get to Dubai in First Class, start to think about the credit cards, airlines, and hotels that can work in partnership to get you there. For example, if you have a boatload of AA miles, you can get Etihad Airways first class Residence tickets using those miles! The options above are enough to get you a first class ticket to Dubai. You’ll probably pay around $100 for taxes. What is the best trip you have taken using award travel? Last year my girlfriend and I took a trip to Venice and paid for it using points and miles. We flew into Rome using AA miles, paid ~$100 round trip for a direct train to Venice, and stayed at Hilton’s Molino Stuckey hotel using HHonors points. It was one of those trips where all of the stars aligned and everything was perfect. Venice is now my favorite city in the world. Seriously, check it out if you can! 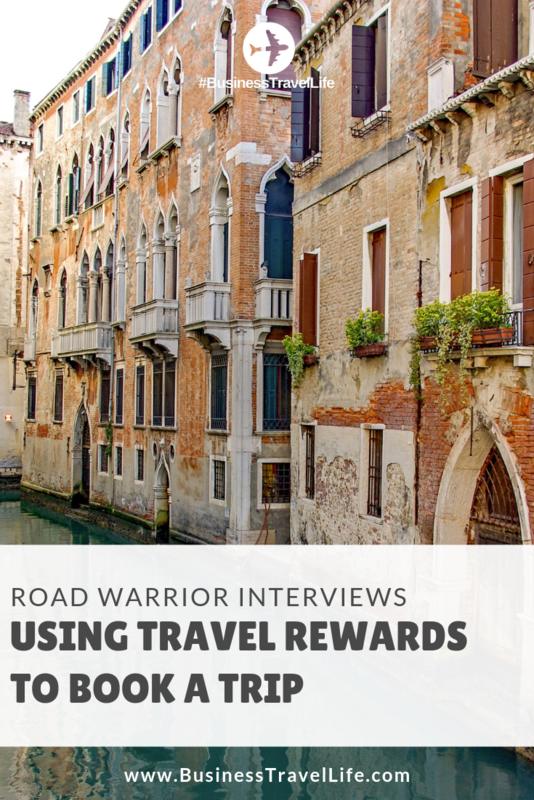 How did you get the idea to help other travelers book trips with award travel? I am a huge believer in the cliché “you only live once”. Why should any of us not have the ability to see the world? Is it because of money? That’s a very valid answer, but what if there was a better way? In fact, there is, and that way is through points and miles. Searching for award tickets to Hong Kong on American Airlines will yield you results on British Airways, through London, and about $1,000 in taxes later. Not possible for the average traveler. But did you know you can book Cathay Pacific using your AA miles, through California, and onto Hong Kong for roughly 90% less? You can do this by searching BA.com and calling AA with the flight numbers. For the miles-savvy people, this is obvious, but for people like my parents who aren’t as caught up to speed, this is a big deal! There are many nuances about the points and miles “hobby” that I have figured out through years of practice and I want to open up a whole new world of possibilities for people like my parents. I love traveling and everyone should have that ability because we live in one world and we should see it all before our time is up. After receiving numerous requests, I decided to start up a business helping folks on the side. I must say, the success has been unexpected and pretty cool. I’m so happy when I’m able to find folks some pretty awesome trips for a few bucks. It’s a rush! You can follow Dominic on Twitter or on Instagram.